When most of his classmates were glued to their books during their free time in primary school, Eugene Cheng would catch spiders for fun. He would later sell the catch to his friends for a dollar or fifty cents apiece. By the time he reached middle school, he had learned to jailbreak iPhones and “un-brick” handsets, and offered the service for about US$80. When he moved to Ngee Ann Polytechnic to pursue a Diploma in Business Studies, Cheng had already mastered the art of money making. He drop-shipped apparels online for extra pocket money and managed to save up a tidy 5-figure sum. Cheng’s lacklustre performance was a cause of worry for his parents as well as teachers. The “ghost” followed him to the college, too. Consequently, the falling grades forced him to sit down with his course advisor for counselling sessions on a number of occasions. However, a determined Cheng decided to rewrite his own destiny through self study. Self education and consistent practice in various areas helped him overcome the challenges he faced as a student. Learning outside of the school curriculum, reading self-help books with actionable takeaways, and learning new books boosted his confidence. It was a business competition at the polytechnic college that got the best out of him. During a marketing lecture, the college announced a business competition, called the Ngee Ann Adelaide eChallenge, for students. Cheng, along with his classmate Kai Xin, decided to give it a shot as they had nothing to lose. The duo couldn’t win the competition, but they emerged finalists. A few days later, during a term break, instead of relaxing and playing, Cheng went to participate in another competition organised by NUS — Startup@SG, where his team came second runner-up. This boosted his confidence. From there, he went to immerse himself into the studies. He studied communications and entrepreneurship, specifically presentation design and delivery. He also set aside S$100 a month to spend on psychology books such as Robert Cialdini’s epic The Science Of Influence, and presentation books like Presentation Zen. This was transformational. Upon his return to the college after the term break, he leverage his presentation skills in class projects. The grades went up exponentially and Cheng became the top scorer in a marketing communications module. “Our clearer and more persuasive approach to presentation visuals and storytelling helped us stand out from the rest,” he smiles. “As advised by a lecturer, I decided to capitalise on my presentation talent. I began to put my work on SlideShare. I realised there were some areas in the presentation that need to be fixed. I worked on this and uploaded it into the SlideShare. This work bagged the ‘top SlideShare of the day’ beating hundreds of thousands of daily submissions. This work stood unbeaten for several years. 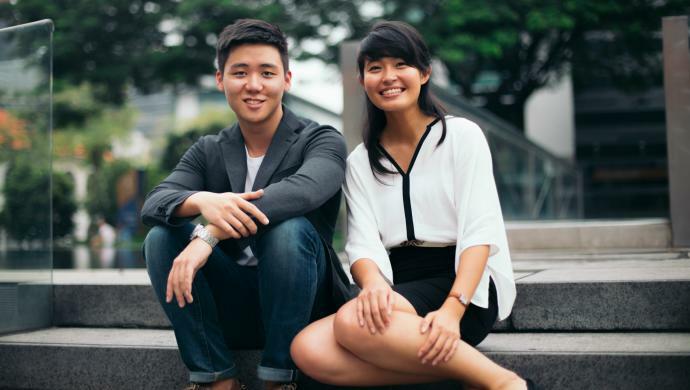 Founded in 2015, Singapore-based HighSpark is a strategic consultancy and training startup that helps corporate leaders ace their presentations. Formerly known as SlideComet, the startup aims to empowers thought leaders to connect, inspire and influence through visual stories. Cheng claims HighSpark is able to transform complex messages into memorable stories, and develop visual presentations that align with the clients’ end goal(s). “Most executives lack the time and communication expertise to present their thoughts and ideas in a clear, simple and persuasive way. This is where HighSpark comes into the picture. We offer presentation consulting, visual presentation and storytelling training, sales training and public speech training. Additionally, HighSpark offers mentorship for startup accelerators on pitch design,” he shares the details. HighSpark’s clients include Mastercard, Nike, Oracle, Singapore Management University, FWD, Startup Bootcamp, JFDI, Finlab, and Ace’s BACECAMP. Cheng claims so far, HighSpark has collectively helped its clients raise close to US$20 million in their fundraising efforts. As a teenage entrepreneur, Cheng faced a lot of challenges in the initial months. The difficulty in convincing clients about the HighSpark’s offerings and the pushback from their respective families, all were dispiriting. “The decision to forgo university did not go well with our parents in the first couple of years. However, after the business turned profitable and a few press coverage, our parents gradually began to accept us and the nagging began to cease,” he quips. Cheng’s National Service also came as a hurdle in their way. This put additional pressure on Xin to carry all the burden herself for two years. After Cheng’s return from the National Service, the business slowly began to pick up. For HighSpark, the first client came through referral from someone Cheng had never met. Cheng was just 19 then. “It was a great feeling, but in the hindsight, I feel I could probably have charged much more. This experience helped us realise the potential of content marketing with presentations and how clients could make a purchasing decision just based on the perception of our online persona and expertise,” he continues. The post How a lazy student who caught and sold spiders transformed himself into a successful founder appeared first on e27.